With Valentine's Day coming up, I needed to make some cookies for the kids. 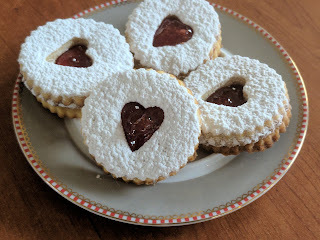 Thankfully, shortbread-type cookies work just fine in my oven and that's exactly what Linzer cookies are. I made them without almond flour so they were just regular flour, butter, sugar and egg yolks. I cut my recipe into a third and that made 22 cookies. I suppose could have made them smaller, but these felt just right. The filling is strawberry lavender jam from my stash. Half are being frozen for now and the other half can be eaten in the next few days. Yum!